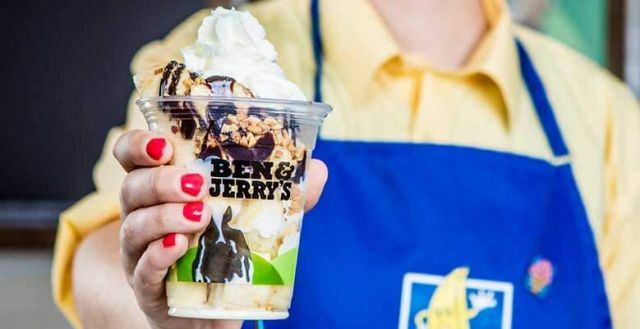 In a partnership with the critically-acclaimed TV series Arrested Development, participating Ben & Jerry's Scoop Shops are serving new Bluth's Banana Stand Sundae inspired by the frozen banana stand of the same name in the series. Bluth's Banana Stand Sundae is available through June 17, 2018 and features two scoops of ice cream and bananas topped with fudge, nuts, and whipped cream. - Peel banana, cut ends off, then slice length-wise. Cut one of the banana halves in half again. Cut the other banana half into chunks. - Place smaller sliced bananas (the chunks) into the bottom of a cup or bowl. - Place a scoop of ice cream on top of the banana chunks. - Place the two remaining sliced bananas (the longer pieces) standing straight up into the ice cream. - Add hot fudge and peanuts on top of the ice cream and bananas. - Top with whipped cream. Photo via Ben and Jerry's.